WWE Legend The Rock recently took to Twitter to comment on "Dark Side of the Ring", a docu-series produced by Vice. The Great One heaped praise upon the series and the filmmakers, calling it a captivating watch. Vice has come up with a wrestling related documentary series, named "Dark Side of the Ring". The first episode focused on the relationship between professional wrestling legends, Randy "Macho Man" Savage and Miss Elizabeth. The two Superstars were a married couple during their WWE run in the 80's. Savage left WWE in the early 90's and never came back. He passed away in a car accident in 2011, and was inducted into the WWE Hall of Fame in 2015. Miss Elizabeth died of acute toxicity in 2003. WWE Hall of Famer Hulk Hogan didn't seem too thrilled by the episode and went on to criticise it on Twitter. The documentary caught the eye of one of the greatest Superstars to ever set foot inside the squared circle, The Rock. He posted a tweet on his reaction to the docu-series, and proceeded to praise the producers for their efforts. 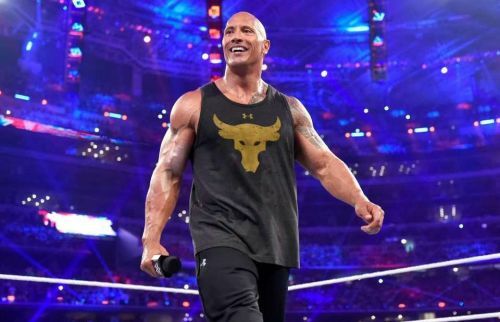 The Rock recommended the series to his followers and went on to state that the tragic stories featured in the documentary are about professional wrestlers, some of whom once wrestled The Hollywood star's grandfather, his father Rocky Johnson, and himself. Dark Side of the Ring airs every Wednesday at 9 p.m. EST on Vice. With the series being highly recommended by The Great One himself, wrestling fans ought to check it out. Have you watched the docu-series "Dark Side of the Ring"? If yes, share your reviews in the comment section!